Hi again! I wasn't intending to take over a week off from crafting, but we had a death in the family. My great uncle died on the 20th at age 99. Ray had been in good health and had such a clear mind. He had been hospitalized on the 16th but had improved by Friday. When the news came that he had died Saturday night, we were surprised to hear that he died. We will miss Uncle Ray so much. He was a dear, sweet, kind man. I went home to sing for the funeral and to spend some time with my Dad. I wanted to make a card for TSTR's "The Sweet Days of Summer" challenge. We were challenged to use the colors in the inspiration photo (pink, peach, green, and neutrals) and create our own flower. 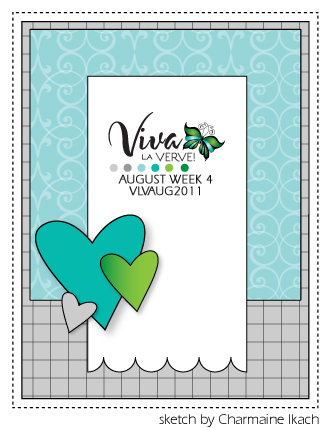 I used Charmaine's VLV sketch as the basis of my layout. I kept it pretty simple and not too flowery as I wanted to make a card to send to Ray's only child, Donald using this sentiment. I stamped a flower along the border and then stamped again without reinking to give it a little more depth. 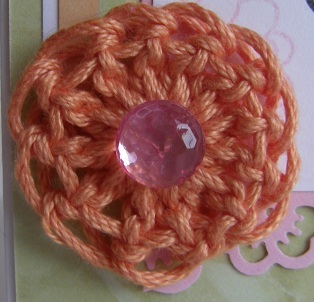 Here's a closeup of my crocheted flower. I used a round button for the center after cutting off the shank so it could be easily glued in place. The flower is a little more light orange than a pale peach, but it's what I had for yarn in my stash! I used Cotton Classic yarn from Tahki to make the flower. 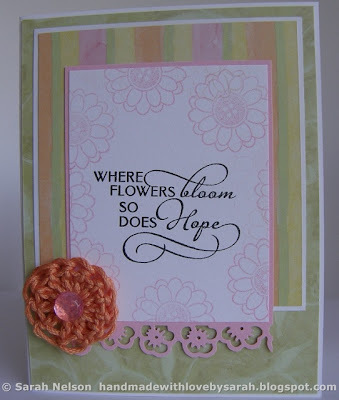 Stamps: Verve "Sunny Days" for flowers and Plain Jane "Where Flowers Bloom"
Ink: Versafine Onyx Black, SU! "Pretty in Pink"
so sorry for your loss, my deepest sympathy to you and your family. 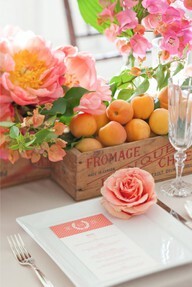 your card is soooo adorable, I luv the cute flower....hope your day is aweosme! such a talent, you even crocheted the flower, WOW!